Will your community join us on Criminal Justice Sabbath? Will you join us in centering the stories of those on the margins - and hearing the cries for justice? Criminal Justice Sabbath is a time for faith communities to lift up ways the justice system impacts us all. It is a day of worship dedicated to hearing the stories of those impacted directly by the justice system, and consider our shared responsibility to help healing. It is a day to make connections between our faith traditions and the current legal system we are part of. Download the Criminal Justice Sabbath Worship Guide 2019 for worship, preaching, adult education, and action for a Criminal Justice Sabbath in your community. Faith ​leaders, spiritual directors, outreach or mission committees,​ teachers,​ education groups, and​ individuals​:​ please read and use this guide in your community. >> Download the 2018 Criminal Justice Sabbath Guide for reflections and also an extensive list of educational resources (last half of the guide) for adult education classes and personal study. >> 2016 Sabbath Resource Guide​ - three sermons included. There's no one way to hold a Criminal Justice Sabbath, and what this event looks like will depend on your faith tradition and the stories of people in your community. You can include a special prayer in your worship service, screen an educational film (such as the documentary 13th), use your sermon or message to speak about violence or mass incarceration, host a table to sign letters to agency officials, hold a drive for toys or other items needed by people in prisons and their families, offer a blessing to members of your congregation who volunteer or work in correctional facilities, host a restorative justice training with your youth group, or receive a special offering for victim service agencies or for groups (like ours!) working for justice. St John the Baptist Episcopal parish in Portland held a Criminal Justice Sunday on September 2, 2018. First Unitarian Universalist Church in Portland hosted a film screening of Rikers: An American Jail, in partnership with EMO and its Ending the New Jim Crow social action group, in September 2018. The Presbytery of the Cascades held a workshop about criminal justice reform, with EMO speakers, at its Spring Meeting in March 2018. The Episcopal Church of the Good Samaritan in Corvallis hosted a Criminal Justice Sabbath in July. 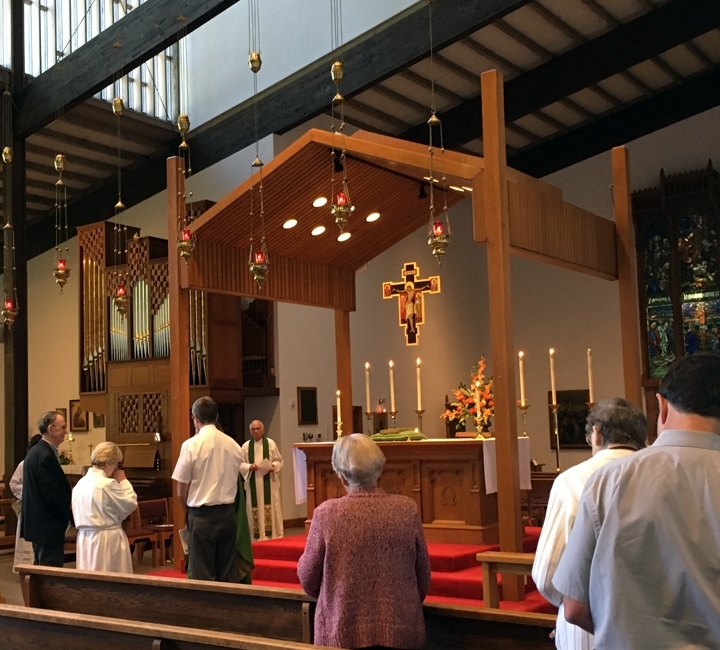 St John the Baptist Episcopal Church in Portland hosted a Criminal Justice Sabbath in September, with a blessing for prison ministry volunteers. St. Matthew's Episcopal Church in Ontario hosts an annual Criminal Justice Sabbath, and continues its connection with its parochial parish, Grace Chapel, inside the Snake River Correctional Facility. You can also bring a guest speaker to join your worship service or an educational opportunity. Ecumenical Ministries of Oregon's Criminal Justice Ministries has a speakers' bureau with volunteers in the Portland and Eugene areas who are eager to join you and help teach, preach, or facilitate conversations. Our speakers each have seminary training from diverse religious backgrounds. We also have policy experts on staff who can address a range of advocacy opportunities. Contact us at cosa@emoregon.org to invite us to join you! If you've already started planning your congregation's Criminal Justice Sabbath, great! Please let us know you'll be joining us, so we can promote how many groups are taking part. If you haven't started planning your Criminal Justice Sabbath, feel free to get in touch with us as soon as you're ready. Contact us at cosa@emoregon.org, and we will talk through options with you to make the most of your day. Submissions are always welcome for the next year's Criminal Justice Sabbath resource guide. Share prayers, poems, short reflections, pictures, or art. Email cosa@emoregon.org to submit. Whether on your own or with your faith group, use this day to pray for those impacted by the criminal justice system. These Prayers for Criminal Justice Sabbath are available for you to use in your worship service; please attribute the source as EMO's Criminal Justice Ministries, 2018. Inside this prison are some of your children. Some live here. Some work here. Some are here to visit. Some are here to volunteer. Some are saved here. Some die here. We lift up every soul who passes through this space. and act on our responsibilities to them. that we have people who love us. that walls do not divide community. Relationship can transcend all distances. Spirits can commune in love across fences. whoever we may be, starting with ourselves and our daily walk. is the Creator, and we are God’s beloved children. every space is blessed, every breath is sacred. even here, Your Loving Spirit flows through and connects us. We are sisters and brothers. a new law to make the whole world renewed. We are called to imitate you in mercy, not judgment. We are called to live as examples, not enforcers. We are called to trust there is enough, and to share. to live up to the dreams you have for us. instead of looking at our own errors. instead of seeking out acts of solidarity. in systems of oppression and violence. and have equipped us to make amends. with humility and not fear. and restorers of justice where it has been breached. We are one human family, though separated at times. ways that are life-giving and ways that threaten us all. or caged, or violated, or forgotten. and our mutual responsibilities to one another. by crime, violence, and mass incarceration. We affirm that they are beloved members of our community. that they might know their stories are heard and matter. and that they are never walled off from you. that they might find a welcome amidst disorientation and courage to start on a new path. to find restored places in community. and its pro-social values of compassion and collaboration. that they might find balm to heal broken hearts. that they might provide a safety net where families cannot. and its opportunities to offer healing in places of hurt. and make real our dreams of a better future. only to find themselves thrust into an inhospitable legal system. healing the harms of trauma in mind, body, and soul. guiding conflicts to deeper healing in collaborative resolution. weakened by the absence of too many moms and dads. that they might know they are loved and valuable beyond measure. that we will continue to remember these people. We will continue to listen to the hard stories. We will continue to work for healing. We will continue to help restore justice. Empowered by Your Spirit, we commit ourselves to this work.